Once known as the "Celery Capital of the World", Oviedo has quickly gone from a rural farming community to the fastest growing city in Seminole County. It's small town charm, convenient location, great schools,abundant recreation opportunities, and affordable housing options led Family Circle Magazine to name Oviedo to its list of top ten best towns for families in the U.S. 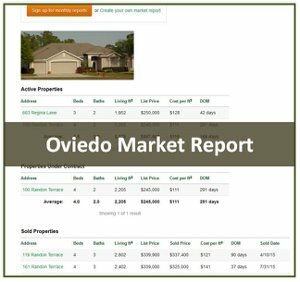 Located just north of the University of Central Florida (now the nation's second largest university), Oviedo is just 20 minutes northeast of downtown Orlando. 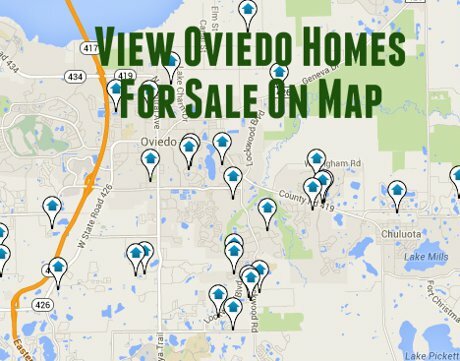 Click here or on the blue button to view all Oviedo homes for sale. Oviedo residents enjoy the Oviedo Mall, Oviedo on the Park, downtown Oviedo, and Waterford Lakes Town Center for shopping. Oviedo provides an easy commute for those working at Orlando International Airport, downtown Orlando, UCF, and the numerous high-tech, defense, and simulation companies located around the UCF area. Schools in Oviedo are part of the Seminole County Public School System, one of the highest-rated school systems in the country, and Oviedo schools are at the top of Seminole County rankings. Oviedo has two high schools, Oviedo High and Hagerty High. They consistently rank as the top two high schools in Seminole County and among the top three or four high schools in the Orlando area. The quality of the schools are a big reason for the popularity of Oviedo real estate. 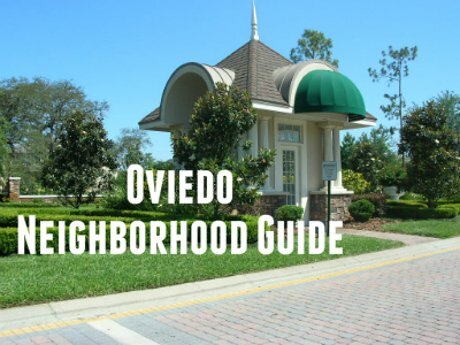 Use our Oviedo Neighborhood Guide to view summaries of Oviedo's most popular neighborhoods. Includes schools, HOA information, commute times, and easy links to homes currently for sale and those that have sold in the last year. Oviedo On The Park is a mixed use project creating a new city center currently under construction at the intersection of Oviedo Blvd. and Mitchell Hammock Road in Oviedo. The first phase includes 280 luxury apartment units, 170 townhomes, and a community park operated by the city of Oviedo. Infrastructure improvements include decorative street lighting, pedestrian streetscape, and seating areas with fountains. The centerpiece of the project is Center Lake Park, which features a Cultural Arts and Civic building, an amphitheater with outdoor seating for up to 1,200, a veteran tribute area, outdoor stage and video tower, a lakeside boardwalk and promenade, splash pad, playground area, a dock with paddle boats, family picnic area, and a dock park. Phase 2 will include almost 100,000 square feet of retail, restaurant, and office space. The development will make it's way north toward the historic old downtown area. Total buildout time is expected to take five years. A few words come to mind when describing downtown Oviedo. Small and quaint are a couple of them. Eclectic or quirky are even more appropriate. While Oviedo On The Park promises a new city center, the city also has plans to revitalize and maintain it's historic downtown area. The area is most well-known for the landmark Town House Restaurant, the massive First Baptist Church, the Nelson and Company packing house, and of course the Oviedo chickens. That's right. Chickens! Downtown Oviedo is famous for its free-roaming chickens, descendants of the communities resident chickens in 1875. They are fed by local merchants and residents and you must be careful for them crossing the road when driving downtown. You can't make this stuff up. 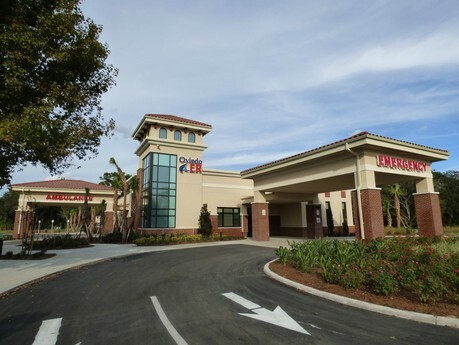 Oviedo ER is a freestanding 11,000 emergency medical facility operated by Sanford's Central Florida Regional Hospital. Prior to its opening, seriously hurt or sick eastern Seminole County residents had to travel over ten miles to Winter Park Hospital. The ER operates 24/7 with physicians specializing in emergency medicine on-site at all times. There are twelve patient beds, a dedicated trauma room, diagnostic imaging services including CT scan, and a laboratory. Oviedo ER is located on Red Bug Lake Road between 417 and 426. Opening in 2017, Oviedo Medical Center will be a 64 bed acute acre hospital with a full range of health care services, including medical and surgical inpatient units, intensive care, cardiology and cardiac catheterization, outpatient surgery, and labor and delivery. The Oviedo ER will be expanded to 22 beds and will become part of Oviedo Medical Center. The city of Oviedo operates several parks and facilities for the enjoyment of its residents, including Riverside Park, the Gymnasium and Aquatic Center, Oviedo Sports Complex, and Center Lake Park. Nature lovers can enjoy the Cross-Seminole Trail and Black Hammock Wilderness Area, both operated by Seminole County, as well as the Little Big Econ State Forest, operated by the state of Florida. In addition, there is a YMCA facility close to the Oviedo Mall.